Cocaine trafficker wanted by the U.S. has been killed in combat. Intercepted rebel communications and other intelligence indicated that Tomas Medina Caracas was killed during a raid on his jungle camp Saturday along the Guaviare River near the border with Venezuela, Defense Minister Juan Manuel Santos told a news conference. Medina was one of 50 commanders of the Revolutionary Armed Forces of Colombia, or FARC, indicted by the U.S. government in March 2006 for allegedly running the country's largest cocaine smuggling organization. He is the first on the list to be hunted down since the United States announced the indictment and a total of US$77.5 million (57 million EUR) in rewards for their capture. "Without a doubt this is the biggest blow ever to the logistical capacity of the FARC," Santos said. Santos said insurgents removed Medina's cadaver to make positive identification impossible. Medina, who led a force in eastern Colombia, is widely credited with reinvigorating the FARC over the past decade by collecting a "war tax" on cocaine shipments passing through the extensive, lawless areas it controls. Although Medina was never believed to be a member of the FARC's secret inner circle of ideologues, he became the first rebel commander indicted by a U.S. federal court on drug-trafficking charges in 2002. The later, broader indictment alleged that Medina had acquired at least 1,000 Kalashnikov rifles and other weapons in exchange for 1.5 metric tons (1.7 U.S. tons) of cocaine. "In many ways he is more important than some of the members of the FARC's secretariat, because he controlled its drug and weapons-smuggling operations and had extensive contacts with the criminal underworld," said Santos. 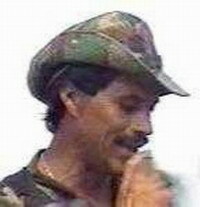 Gen. Freddy Padilla, head of Colombia's armed forces, said Medina had eluded capture on several occasions.